'Good Vibrations' celebrates the story of Terri Hooley, widely considered as the "Godfather of Belfast punk". His record store and label of the same name helped launch the careers of Rudi and The Undertones. This witty biopic successfully pits the inspiring activities of Hooley amid the decades of civil unrest in Northern Ireland, exemplifying the inherent nature of music to unite, rather than divide. Hooley (Richard Dormer) finds himself in an unusual situation in the 1970s - uninterested in the political divisions that have consumed the majority of his friends, he opens a record store. In one of the most bombed areas in Europe. Hooley's Belfast store, Good Vibrations, nonetheless thrives and soon, he discovers that the youth are railing against the political difficulties of the time by investing themselves in a burgeoning punk scene. Hooley becomes a defacto leader of the scene when he decides to start putting out records under the Good Vibrations banner, with bands such as The Outcasts and The Undertones on his roster. The moment when Hooley first hears 'Teenage Kicks' is captured magnificently by director Glenn Leyburn, the excellent and endearing Richard Dormer standing wide-eyed in awe upon listening to the seminal record. A reaction seemingly shared by influential radio DJ John Peel, whose unexpected support invigorates Hooley. Hooley becomes record shop boss, label head honcho, and tour manager, rather leaving his relationship with his wife (Jodie Whittaker) in the doldrums. Similarly, his relationship with his family becomes strained but these sub-plots feel undercooked but perhaps understandably so - the music is what Hooley cares most about, and many of the audience will feel the same. Especially with such a strong and evocative soundtrack, featuring the likes of Suicide and The Shangri-Las. 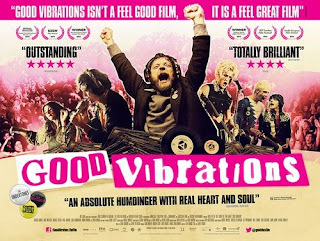 'Good Vibrations' charmingly charts the highs and lows of Terri Hooley, although as with any film based on a true story, there are underlying question marks over the veracity and extent of some of its events. Nonetheless, 'Good Vibrations' is a well-crafted biopic that manages to balance the troubling civil issues of Northern Ireland against the united spirit of punk at the time. 'Good Vibrations' is released in UK cinemas on Friday 29 March '13, through The Works.